Disclaimer: I received a free entry to the Rock ‘n Roll Philadelphia 2017 race as part of being a BibRave Pro. Learn more about becoming a BibRave Pro (ambassador), and check out BibRave.com to review find and write race reviews! All opinions are my own. Way back, when I first started running and doing fitness related activities and prior to Scoot a Doot, I had a blog on tumblr. 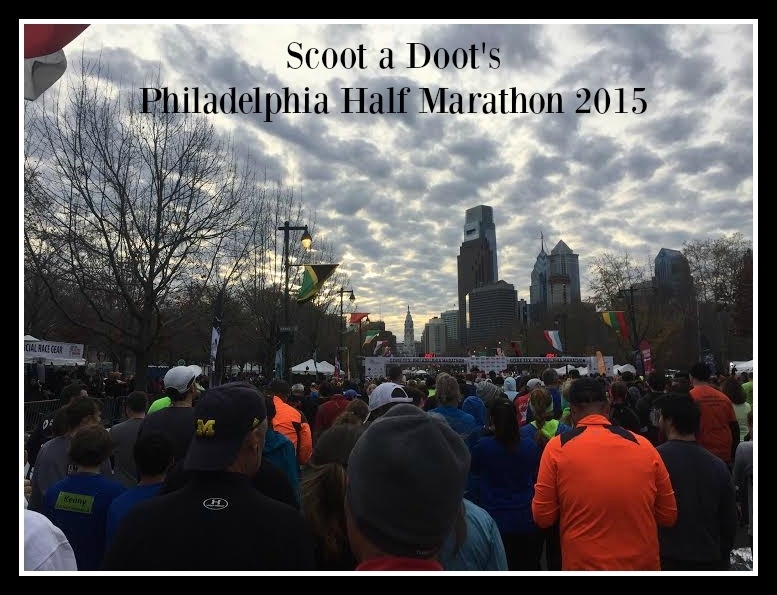 It was there that I blogged about my third half marathon, the Rock ‘n Roll Philly race back in 2012. I haven’t been able to work it into my schedule since and to be honest, I had a tough race so I think I was a bit gun-shy. However, the stars aligned and I was excited to return this year, especially as it was my first race representing BibRave! Rock ‘n Roll weekends always start with the expo experience, followed by the race. The Philly Rock ‘n Roll Health and Fitness Expo was held at the PA Convention Center in Center City on both Friday and Saturday. Runners are able to pick up their bibs, t-shirts, and other assorted race goodies. If you want to read more about the expo, swing by my last post. This is the 40th year that this race has been run, having been known prior as the Philadelphia Distance Run. Saturday morning were the 5k and 10k races. The 10k distance was newly introduced this year; I had friends who ran and had a positive experience. Sunday morning it was half marathon time. 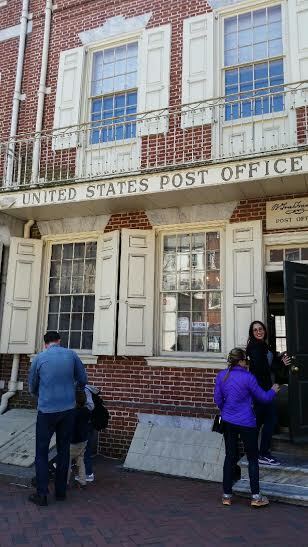 Philadelphia is about a half hour drive from my house/nearby train ride. I chose to take the train and walk a mile to the start line, which is my standard mode of transportation for Philly races. I always aim to get into the city about an hour before the start of the race and this one started at 7:30, so I made sure to get the train that arrived at 6:30. I knew I would have plenty of time, given that I was in corral 21 (I think there were 24 total). Once I arrived I tracked down where I needed to go to get my race shirt after the snafu on Friday. Since I had a hydration pack, I decided to stuff it in there, rather than check a bag. Rock ‘n Roll’s race village is huge and there’s plenty of things to do and see both pre and post race. I wandered around a bit, chatting with plenty of random people aka new friends and seeing fellow BibRave Pros. Philadelphia’s Rocky Steps, aka the Art Museum, is always the backdrop of big races in Philly and this was no exception. The race began on time and I casually wandered into my corral, knowing that I wouldn’t be starting for awhile. The announcers were enthusiastic (honestly, if I yelled as much as they do, I would have absolutely no voice!) and they were playing great music to get everyone pumped up. The first 5 miles of the half course have to be my absolute favorite. I love running in Center City and the energy is always terrific. From about mile 3.5 to 5 is an out and back stretch along Fairmount Avenue, which I love because you can see the other runners and the cheering from people along this stretch is fantastic. Very motivating and so much fun. 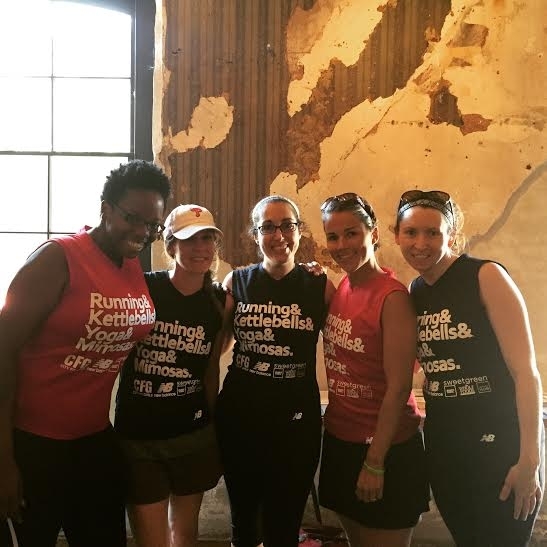 The second part of the course leads you along the Schuykill River on Kelly Drive, across Falls Bridge, and back the other side of the river on Martin Luther King Jr. Drive. The miles seem to stretch here and while the scenery is picturesque, this is where I wish they would stack the bands and entertainment. I knew I wasn’t going to break any personal records during this race so I enjoyed, took my time, and had my phone out nearly the entire time to take pictures and videos along the route. I made a friend during the last mile that I had been leapfrogging with since mile 10 and we finished the race together, which was really nice! The medals for this year were money, baby! 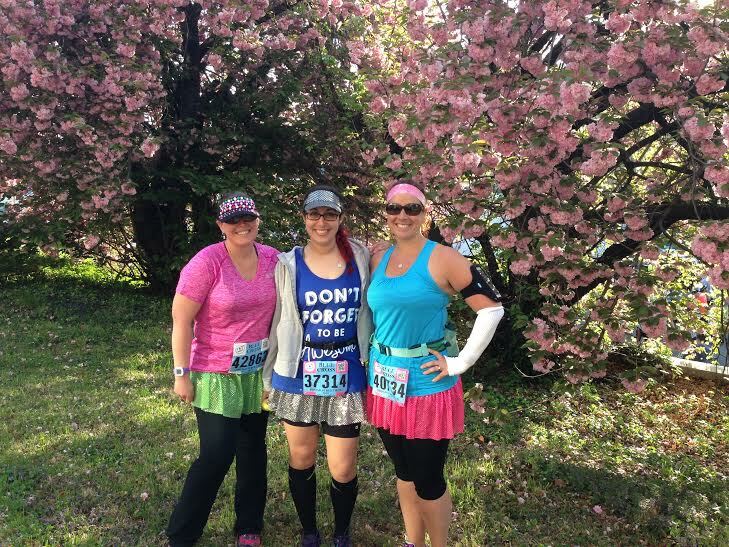 The half marathon medal was Ben Franklin with a sweatband on his head 13.1 bill. Too funny! Immediately after the finish line, they were handing out water and a sports drink. Directly after that there was ice cold chocolate milk, which hit the spot! They were also giving out ice cold RnR towels, which was perfect on my neck. There were snacks directly after but unfortunately, juggling everything became a bit of a challenge! Post-race celebration included the band Big Head Todd and the Monsters (never heard of them before but they were entertaining). There was also a beer garden but I completely forgot about it until I was walking back to the train station. Whomp, whomp. At least I got a banana phone! Fun way to kick off fall racing in Philly! From here I have the Run the Vineyards, Destination Enoteca 5k and the Run Inspired 10k in October. Can’t stop, won’t stop! But I wasn’t snoring! I was running 10 miles. 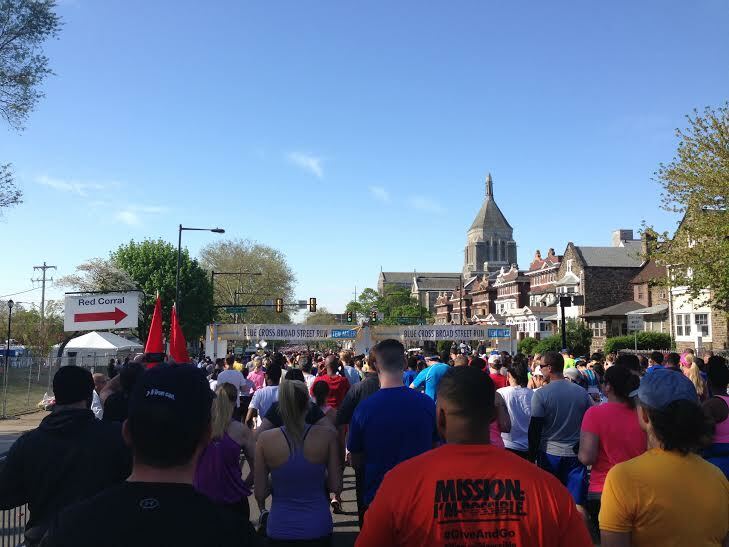 This year’s Broad Street Run was unlike years past. 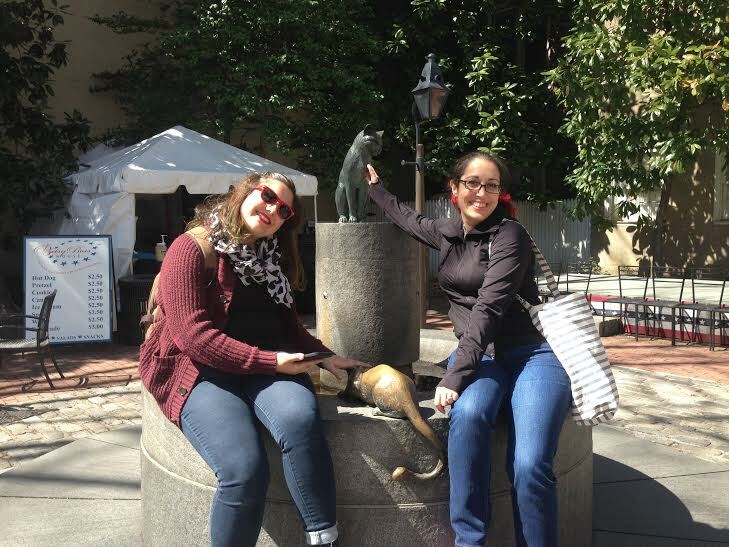 Back in 2013 I wrote, If Broad Street Were Easy, It Would Be Called Your Mom. 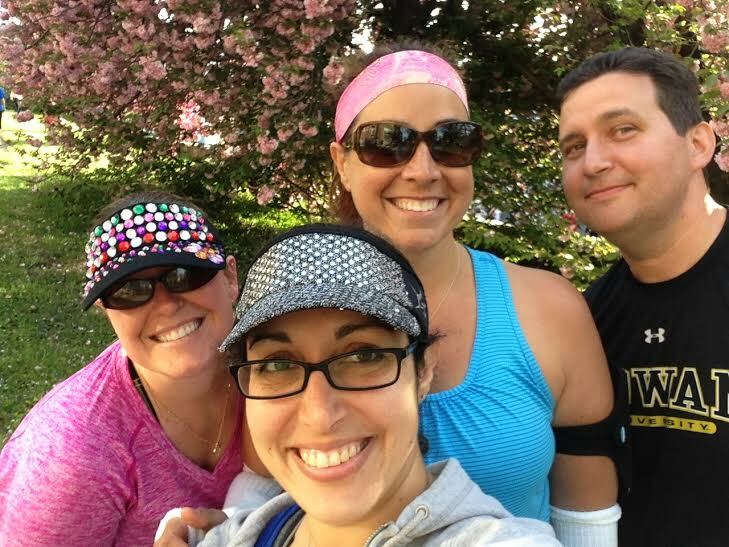 Last year I talked my reluctant runner of a husband into running with me and my childhood pals. But this time? This time it was all about reminding myself that I have it within me to do difficult things. We all need that reminder occasionally. So, here are a couple of facts about my race. My goal was to hit under 2 hours. I did not achieve that goal. Were it a different day, weather wise, I have no doubt that I could and would have. But it wasn’t a different day. That was the disappointing part. Whomp whomp, poor me. However, I DID HIT A PERSONAL BEST! 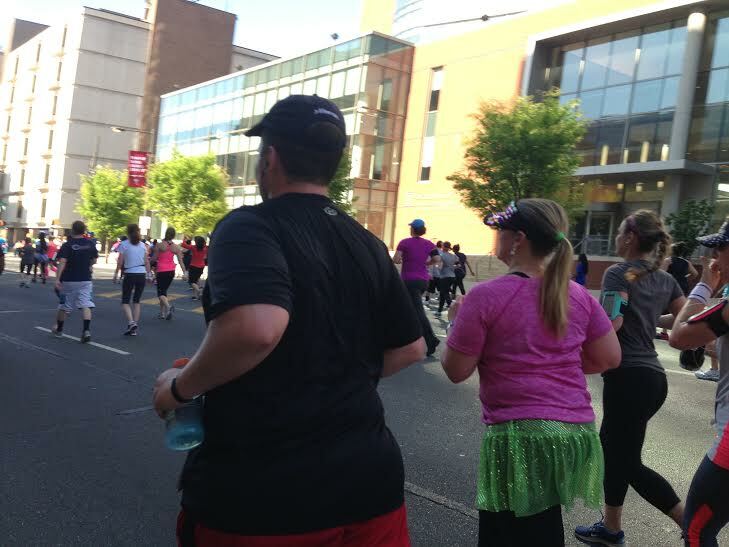 My best time before this year at Broad Street was back in 2013 and that was in 2:04:48. This year I finished in 2:03:35. Not too shabby! 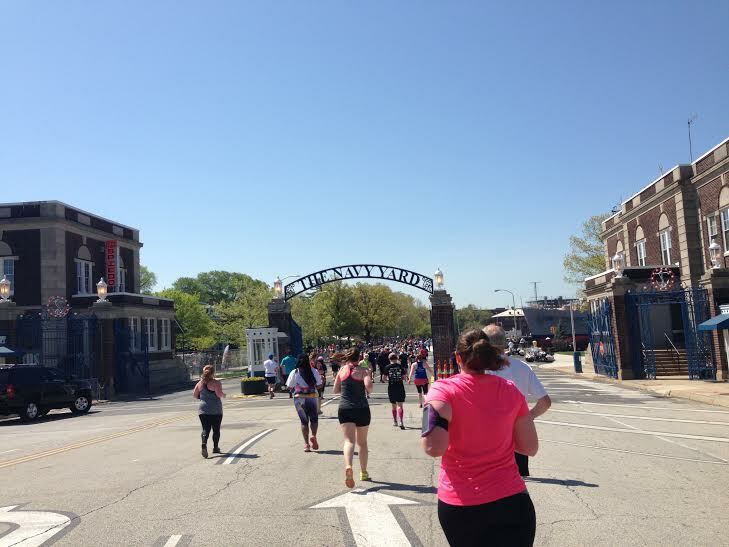 The race is point to point, starting near Central High School and finishing right inside the Navy Yard. 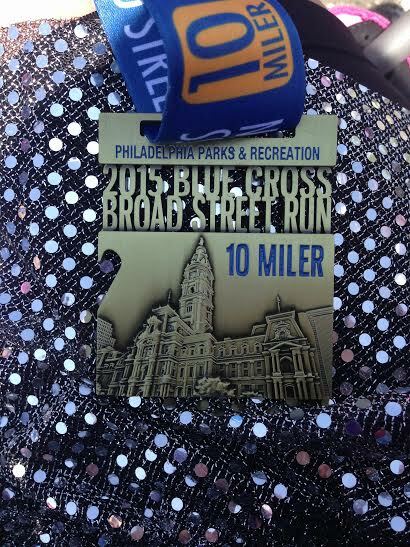 As such, I always park at the nearby stadiums and take the Broad Street line (free on race day with a bib). This year I traveled in solo and planned to run alone, but knew that I would be very lonely leading up to the race. And that’s where two rays of sunshine came through! I met up with Jenna and Julie, two of my fellow Team runDisney pals. 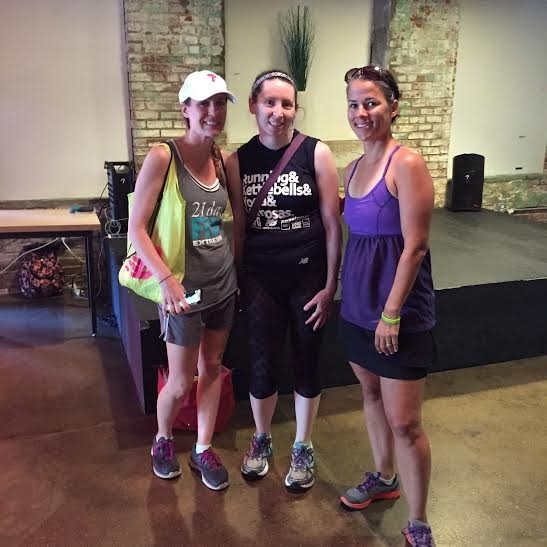 Since all three of us were traveling to the start line solo, we decided it would be great if we could meet up prior and keep one another company. Jenna, Julie, and myself. Only the finest plastic ponchos will do for Broad Street. Arriving at the parking lot at 6:30, I soon found Julie (and her parents) and from there we met Jenna. The trains were one right after the other so we were able to jump right on and head to our corral. The rain only seemed to worsen as we traveled underground and when we emerged from the stairwell, we quickly realized that there was no way to easily move around the sea of ponchos and umbrellas. Our plan was to meet up with other friends for a group picture but it was a no way, no how situation. Waiting for the race to start was pretty miserable. Being in the last corral on a beautiful day isn’t bad. Being in the last corral in the rain is exactly what you’d imagine. Socks and shoes quickly get soaked, you get poked by umbrellas, and you can’t really hear people when you have plastic surrounding your head. But it is a heck of a lot better with friends. You can laugh at yourself, question your sanity, and realize that you’re surrounded by other people who are literally just as crazy as you are. Plus, I kept reminding myself how the kids handled the rain during the Color-A-Thon. Eventually we started inching our way up to the start. I ate my first Gu as we shuffled forward. I had my phone in a plastic baggie, in my Spibelt, under layers of clothes so I knew I wouldn’t be taking pictures on the course. It was survival mode, and by that I meant both myself and my phone. From the get-go I knew that I would run the first mile straight and then fall into my 1:1 intervals. 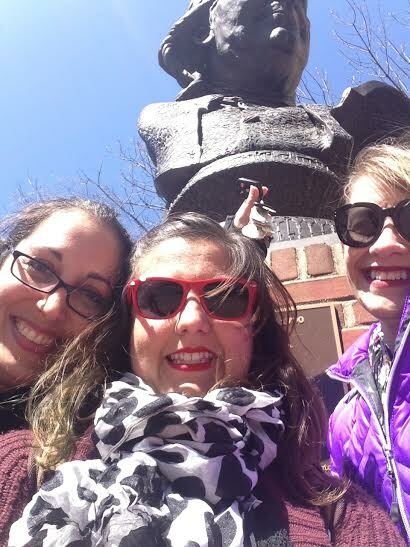 As such, I said goodbye to Jenna and Julie and set out to get it accomplished. We crossed the start line 57 minutes after the race started. Fun fact, the winner this year finished in 48 minutes. We were still at the start line when he crossed the finish. Crazy! The first mile was not as fast as it could have been. I usually bank my time to give myself a cushion for later on. However, my muscles were cold and stiff from standing in the rain for over an hour. My pace was consistent throughout the race. In fact, I hit the 5 mile mark at 1:01:30. My 5 mile race a week before was 1:01:48. I tried desperately to pick up the pace the second half the race to keep the under 2 hour dream alive. I was running faster but walking slower during my walking intervals. Oh, and I was sporting my poncho the entire race. At some point it spun around so that my hood was in the front and I couldn’t figure out how to turn it around. My mind apparently just stopped working and I really couldn’t figure it out so I left it. Blame it on the rain that was fallin’, fallin’. I have no pictures at the finish line so you’ll just have to trust me when I say, I was very happy it was over. And happier still after I changed out of my wet clothes and got a beer in my hand! Let’s talk some other good stuff… I was blown away by the amount of support that was out there. 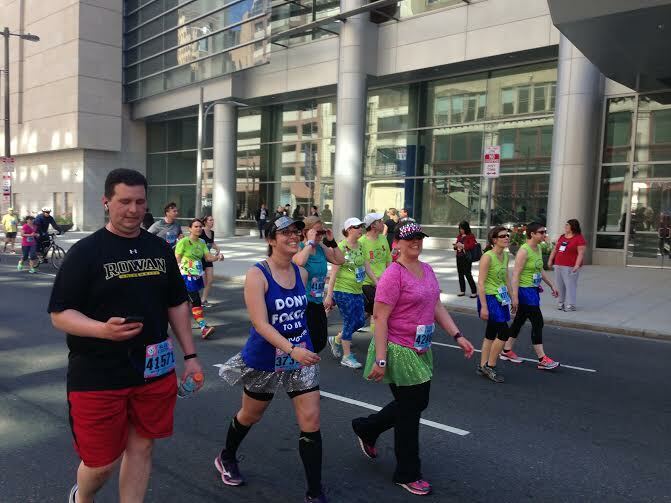 The people of Philly really do love to love and the amount of people that lined the streets with cowbells, pots and spoons, signs, and even children doling out the high fives was still more than I’ve seen at other races on bright and sunny days. There were bands playing and the amount of people at City Hall was comparable to the other two years I’ve done this race. Just as impressive were the volunteers who were out there getting it done like it wasn’t even raining. They cheered loudly as we came through. At mile 7ish there was a volunteer chanting “Don’t stop, get it, get it!” over and over and the enthusiasm was contagious. Not everything is going to be easy and this race was a good reminder of that fact. Attitude has much to do with success and while I didn’t hit my exact goal, I’m very proud that I got out there, ran in the rain, and gained a shiny new PR! What’s really exciting for me is when I returned home from my race, my 11 year old told me he wanted to start running with me again. That is a really big deal! It’s been nearly a year since we’ve run together and while I do this for myself, I also do it to be a good example for my children. Needless to say, I can’t wait for tomorrow. 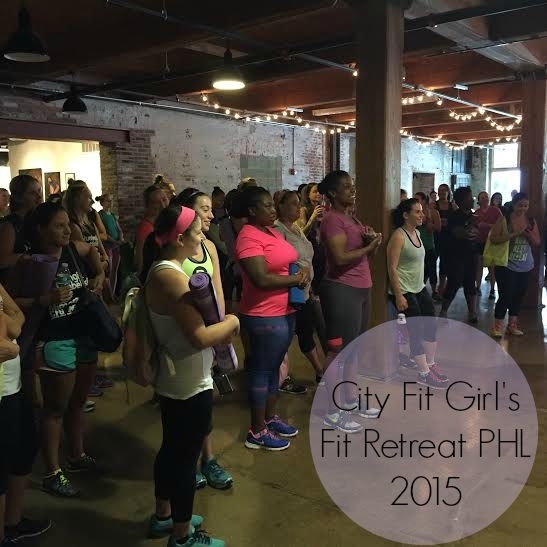 City Fit Girls – Fit Retreat PHL Jawn! GOODNESS. 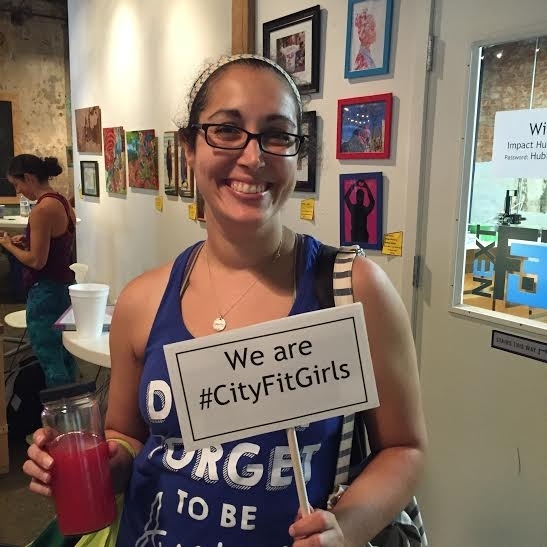 I think that’s really the best way to describe the Philadelphia Fit Retreat hosted by City Fit Girls. It’s no secret that I’ve been sort of meh when it comes to my workouts lately. Dealing with an injury has kept me from running and while I have been going to the gym twice a week, I’ve been in a rut. 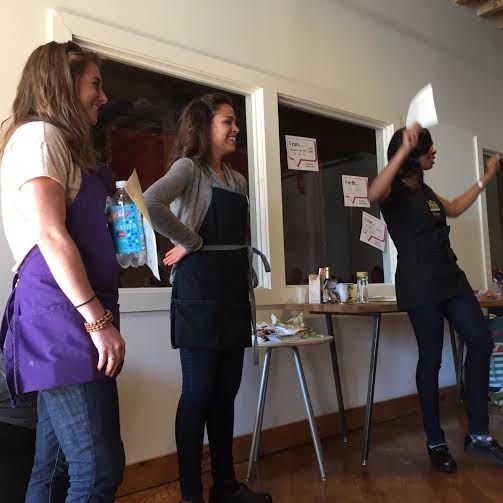 But the goodness that was Saturday’s Fit Retreat really shook the cobwebs from my workout soul. Before we go any further, I learned a word this weekend and that word is JAWN. Apparently it’s has been around awhile – at least in Philly. So please, just smile and nod. I don’t get out much. If you are like me and don’t venture out often, jawn is an all encompassing word that can be used for anything. If you take anything away from this blog post, let it be that. Now that that’s out of the way, let me tell you why this Fit Retreat PHL jawn was the best ever. First and foremost: THE PEOPLE. 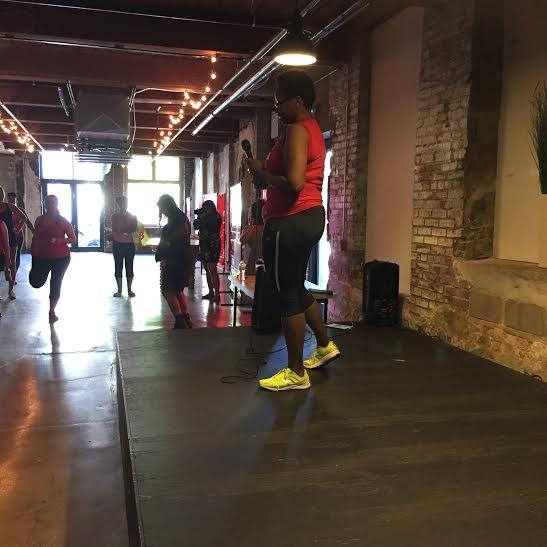 From the co-creators of City Fit Girls (Kiera Smalls and Takia McClendon), to the top-notch instructors (Diva Richards, Mark Donohue, Rachel Rubin, Veronica Dilzer, and Brittany and Gillian from Grace and Glory Yoga), to the 150 attendees… this was a quality group. I felt comfortable, welcomed, and appreciated from start to finish. These are my people: Sue, Maureen, and Jen. It’s always nice attending an event with friends. By the end of the first session, I felt like I was surrounded by new friends! We were greeted as soon as we arrived and because of the small amount of attendees, we were always able to find a familiar face. During the introductory speech we were encouraged to test our limits and also cheer for each other. And I promise you, it was not just lip service. The good vibes were flowing through the Philly Impact Hub; the space was fantastic and, even more importantly, the people were fantastic. The cap of 150 people was perfect for the space and for each session (two-three were going on at any given time). While chatting with Kiera toward the end of the day she said that City Fit Girls are excited to work with a variety of brands to introduce the women in our network to new and exciting products. Therefore, they don’t just stick with one way of doing things; they’re presenting new and different workouts constantly. I appreciated the concept and from chatting with other people there, it gave them warm fuzzies too. No ruts to be had! 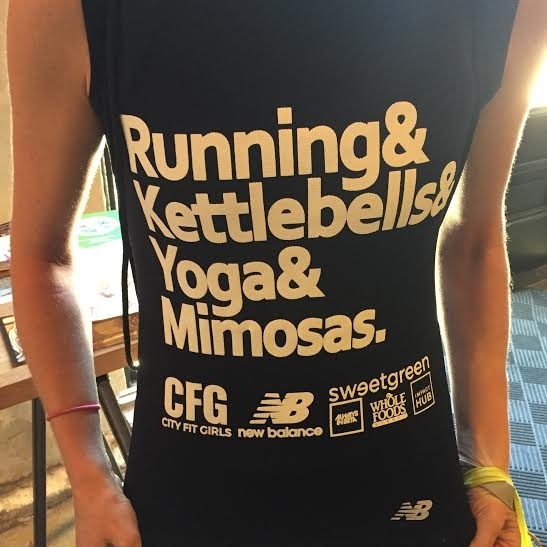 Plus New Balance sponsored this year’s FitRetreat and that, in itself, was pretty amazing. The VIP ticket for the event was less than $40! The way I figure it, that is about 10 cents a minute of AWESOMENESS. Worth each and every cent and then some. 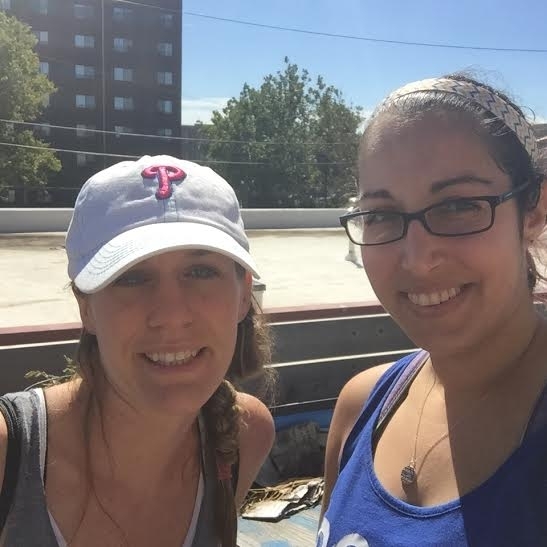 After posting about it on my Facebook page and recruiting a couple of awesome friends, Jen and Sue, we were quickly planning our trip to and from the city’s Impact Hub -a really awesome co-working space in Fishtown. 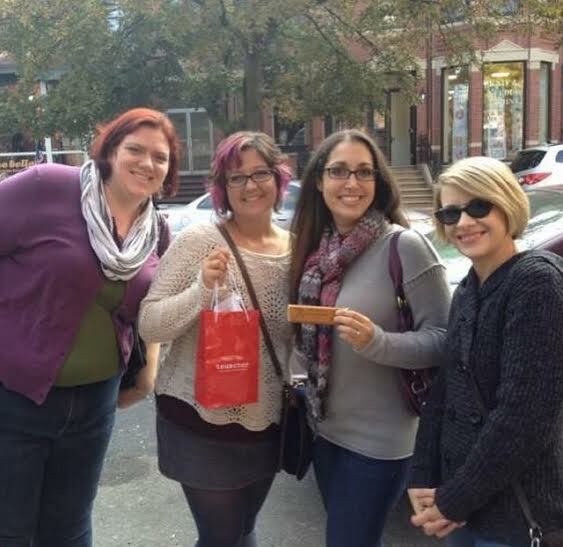 Thanks to City Fit Girl’s agreement with Lyft, we were able to get in and out of the city for mere peanuts and not have to worry about parking (and honestly, I do worry about parking – cost of parking, parallel parking, not hitting other cars while parallel parking – I could go on). The cost included an awesome shirt. And an awesome massage (which I skipped but Jen didn’t, so I know it was awesome – she said that it actually released her emotions!). Did I mention the very awesome workout sessions? 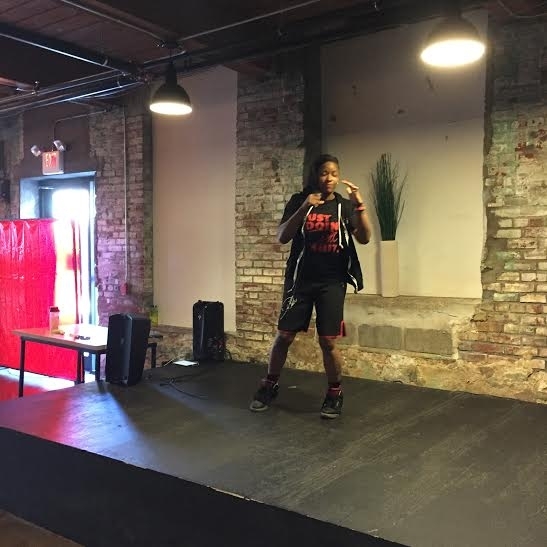 I was able to participate in three workouts and a few informational sessions including healthy eating tips with Whole Foods and skin and facial care. Dear Whole Foods, we love you. 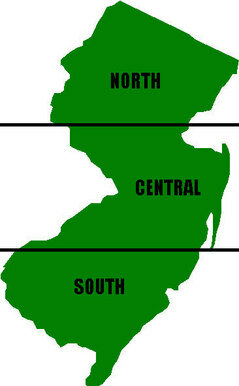 Please come to south Jersey! You know how you sometimes you don’t realize what’s missing in your life until you experience it? That was the case with ALL the sessions at the Fit Retreat. How often can you say that? The main reason for the day (at least for me) was to hit up some amazing workouts and try things outside of my comfort zone bubble. It’s been awhile since I’ve been to a group fitness class like the ones that were being offered at the Fit Retreat. Diva Richards at the start of her session. Unfortunately a time turner hasn’t made its way to Philly yet so I had to choose a few sessions that really spoke to me. I went with Killer Kardio with Diva Richards, Mid-Morn Workout Jawn (there’s that word!) 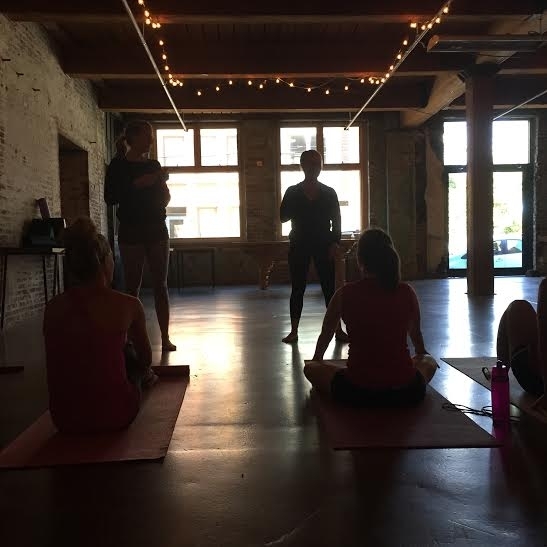 with Mark Donohue, and Vinyasa Yoga with Brittany and Gillian. 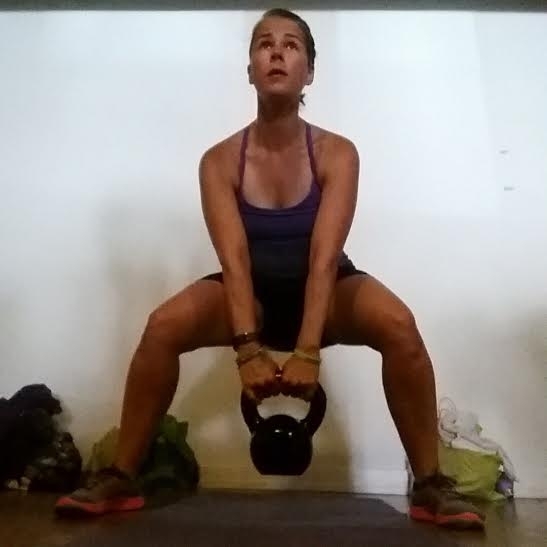 Jen during the Kettlebell Kundalini session – this was limited to 50 participants because kettlebells were provided and Jen got the last spot! Score! The sessions were no joke. I thought that they might get progressively easier through the day but nope. They did not. The intensity was strong from start to finish but the words were encouraging and we were reminded to do our best and to think of where we are in our own journey. 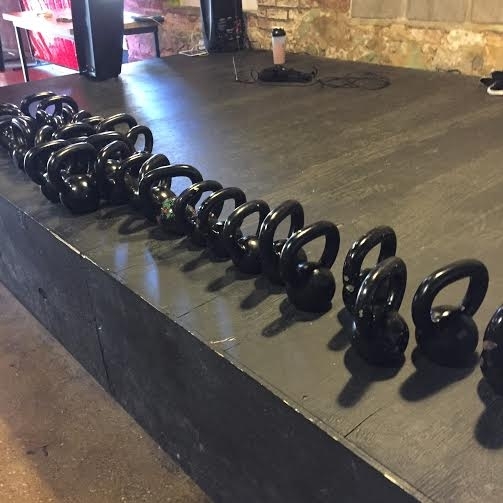 There was everything from kickboxing moves to burpees to oh, approximately one billion squats. Mark Donohue played Flower and with every “down” we had to do a squat and hold it until the word “up” was said. 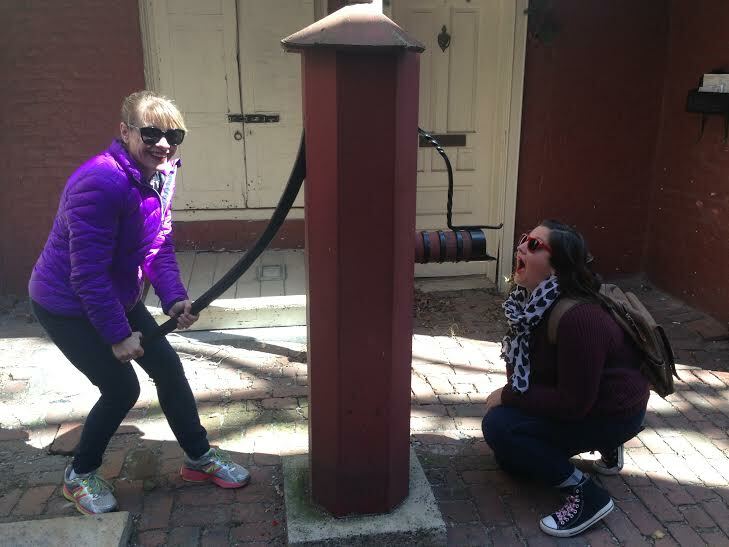 I might have been cursing. We did planks, planks, and more planks, and in between the planks, since we were down there, we did pushups. The biggest surprise for me was how difficult the yoga session was for me. Because, hello, YOGA. I can handle yoga, right? But my foot was already tired from the rest of the sessions and didn’t want to ground itself. It made for a wobbly experience and there were a few times I had to chill in Child’s Pose rather than take part in all the poses. It made me angry. Yoga isn’t supposed to make you angry, I know. But it did. I think it’s mainly that I’m so used to reminding myself “I can and I will” and I couldn’t, right then and there. However, thanks to the gentle reminders from Gillian and Brittany, I was able to focus on what I was able to do within those moments and let the rest go. I’m sure I’m forgetting something or many things. Oh, like the vegan Watermelon What What drink from Gangster Vegan Organics that was pretty gosh darn awesome. The entire day was so good for me and my soul. Every event should flowed as well as this one did. The sessions reminded me of my strengths and also gently nudged me to forgive my weaknesses. And it was good. So very good. 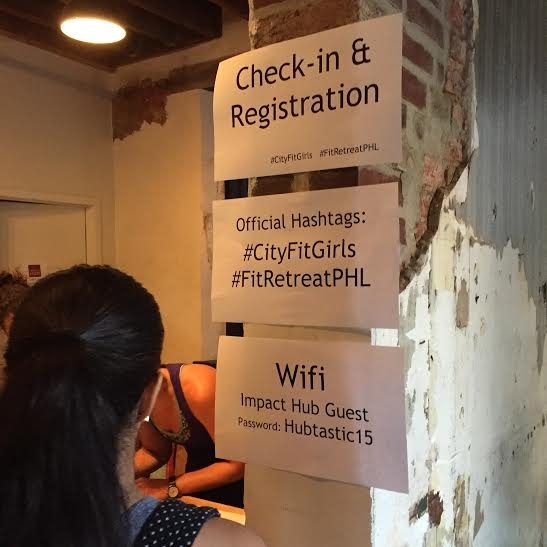 Kudos to the City Fit Girls and all the sponsors of the Fit Retreat Philadelphia! You hold another event and I’ll be there, no doubt about it. 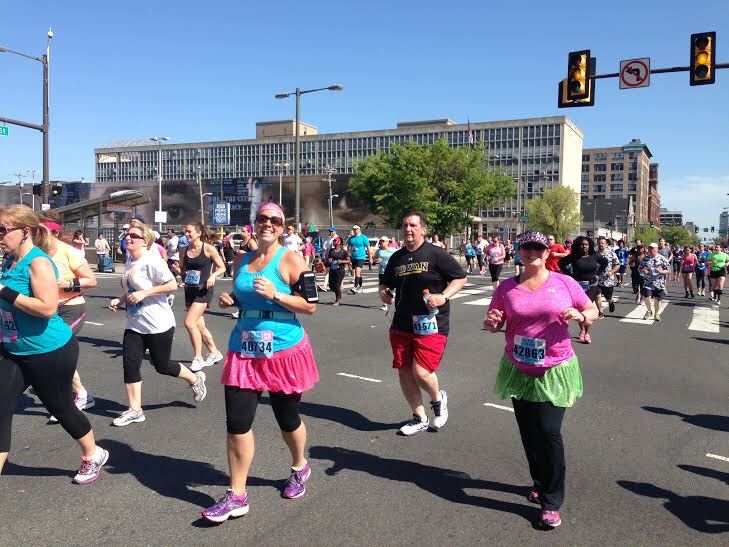 The Broad Street Run. The past few months we spent so much time doing training runs and preparing for the race; now I have the post race blues. Whomp. 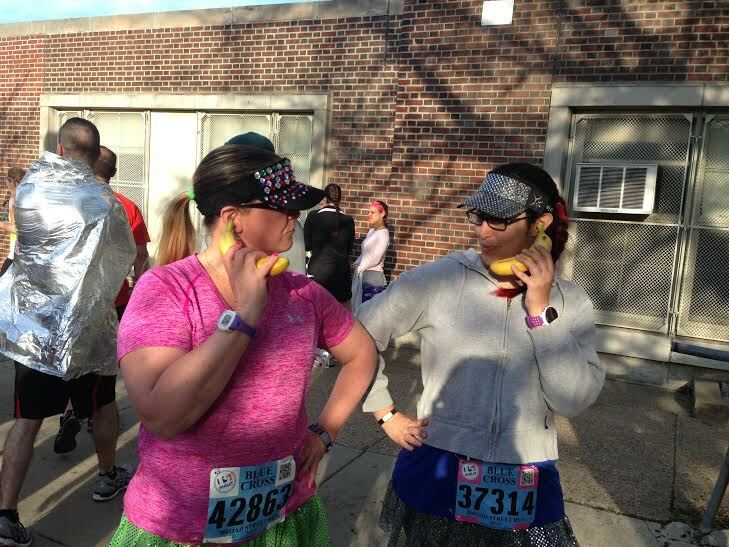 So what about my husband, Jay, the reluctant runner? How is he feeling after all of this? A little history: the Blue Cross Broad Street Run has been in existence for 36 years. It boasts that it’s the largest 10 mile race in the USA and I sure can believe it! The results page shows that 41,511 runners participated and the numbers on the bibs went into the 43,000s. That’s a lot of people. And it’s a lot of Philly love through and through. We were in the pink corral, which is the very last corral, for those expecting to finish in 1:45 or longer. Which is exactly what category we fell into (the “or longer” category). During training runs we kept Jay’s pace, which put us at an exact 13 minute mile pace. Joining us for this run were two friends who I’ve known since flowered baby doll dresses were in fashion and running was uncool: Keri and Chrissy! 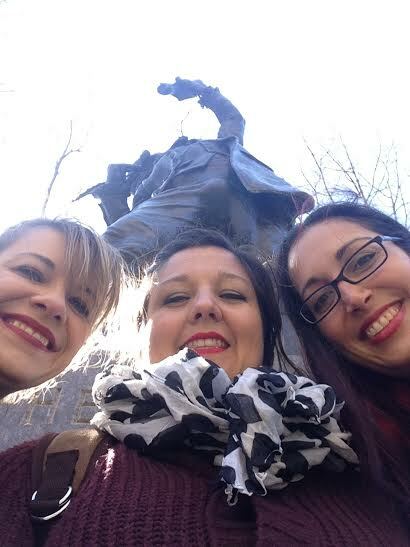 Chrissy, me, Keri – never ever forgetting to be awesome! 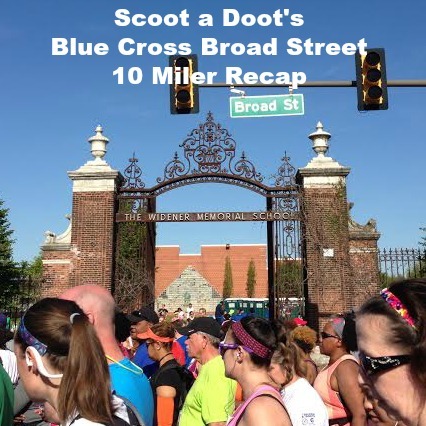 Since Broad Street is a point to point race, we parked near the finish line at the stadiums and took the Broad Street rail line, which is free for runners on race day, to the start staging area. We got there in plenty of time and were able to use the porta-potties and take the above pictures without feeling rushed. When you’re in the Pink corral, it’s a lot of “hurry up and wait”. Ahhh, the Pink corral. Let me set the stage. You’re so far back from the start that you can’t actually hear the start of the race. No Star Spangled Banner for us and no clue of what’s actually going on up at the start of the race. So yes, a whole lot of cluelessness. We stood (im)patiently, waving to the helicopters circling overhead and entertaining ourselves. 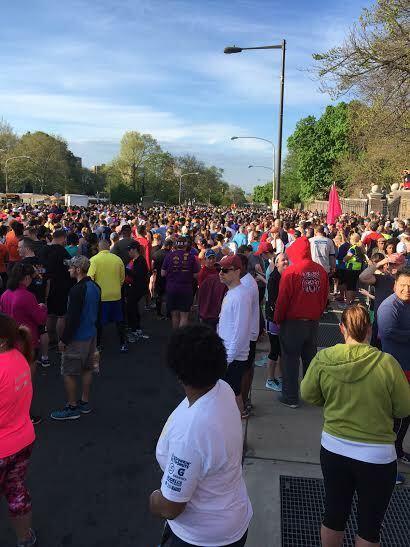 In 2013 I started in the Pink corral and we got to the start at 49 minutes after the start. This year we started at 59 minutes after. More runners? More people in Pink? Not sure. But after one last stop at the porta-potties, we were off to the sounds of Weezer (anyone who knows me knows just how much this thrilled me). I’d never been so excited to see a START line in my entire life and that’s a fact. Jay’s plan, so subsequently OUR plan, was to run the first mile and then switch to 2:1 intervals. And run he did. That dude clocked a 10:30 the first mile. I asked him about twenty times if he knew how fast we were going (because it was definitely faster than his normal mile pace) and he either wasn’t able to hear me over his music or he was ignoring me. I’m going to go with the first thought. We hit the mile mark quickly and then switched into the 2 minutes running, 1 minute walking. The first five miles were flawless. We kept a solid averaged 12:20 pace after that first speedy mile and everything was going swimmingly. Runningly? That. We were cruising and everyone seemed as happy as running people could be. There were bands. There were cheer squads. There were children outside of the children’s hospital again, waving and smiling and cheering from their wheelchairs. City Hall was becoming a more real sight and less a speck in the distance and it’s incredible. 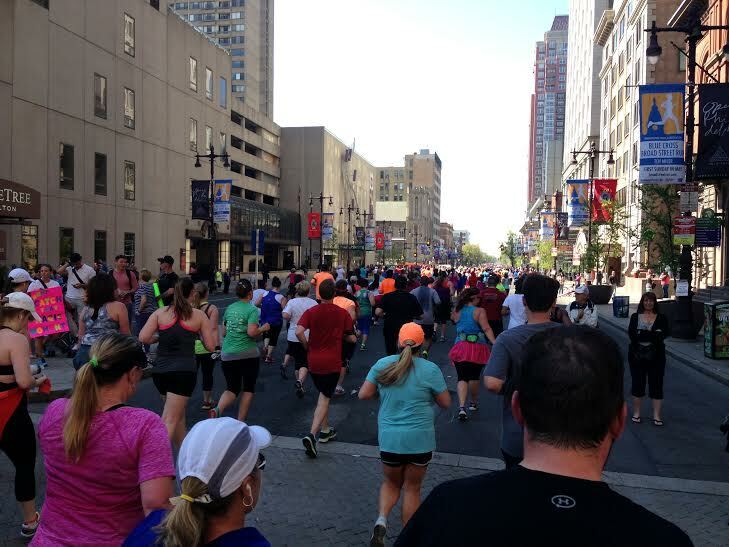 The Broad Street Run can be separated into two parts. Running toward City Hall (which is AWESOME) and then the after City Hall part. Which, I think, is still awesome. But that’s when you really start feeling the race. Mile 6 our pace slowed up a bit and our aches started to make themselves known. Personally I’m dealing with another bout of plantar fasciitis, which in no uncertain terms, BLOWS. It flared up during my last training run and here I am, dealing with it again. I was feeling it. Jay hips weren’t lying when they said they were feeling awful. Chrissy’s knee was acting up. And Keri’s shins were making a bit of noise. Thankfully the crowd support was just as awesome the second half as in the first half and we relied on that to help get us through those tougher miles. To really see all the signs, click on the pic. They were the best! The water stations increased in the second half, which was good because it was pretty toasty out there. We haven’t had many hot days to train in so this was a little different than the weather we’ve been used to but the additional water and the occasional fire hydrant open helped cool us off. The cups on the street were a little slick, which comes along with a race as large as this one and not being able to clear them all. The entire race Chrissy, Keri, and myself spent surrounding Jay – his own personal sparkling cheerleaders. Since Jay was plugged in to his music, we chatted along the way, pointing out cool sights and fun stuff. 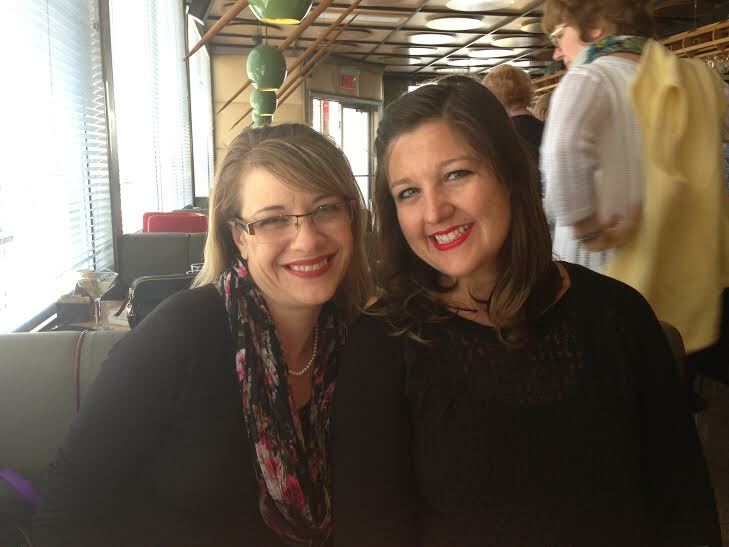 I hadn’t seen Chrissy in years before this weekend so it was really great to catch up! Yet another bonus of running 10 miles together. You’ll notice that there are less pictures of Jay here. That’s because he was not thrilled with life. I took a selfie with him at one point. I’m not going to post it though because he just looks miserable. In fact maybe I’ll delete it from my phone and he’ll forget all about that feeling. Maybe? The first part of the race has City Hall to focus on, while the second part has a slightly less visible sight, until you’re right there. The Navy Yard sign. It signifies that there’s only about a quarter mile left so we were pretty jazzed to see it! Or I was pretty jazzed. I think Jay was saving his excitement for the finish line. 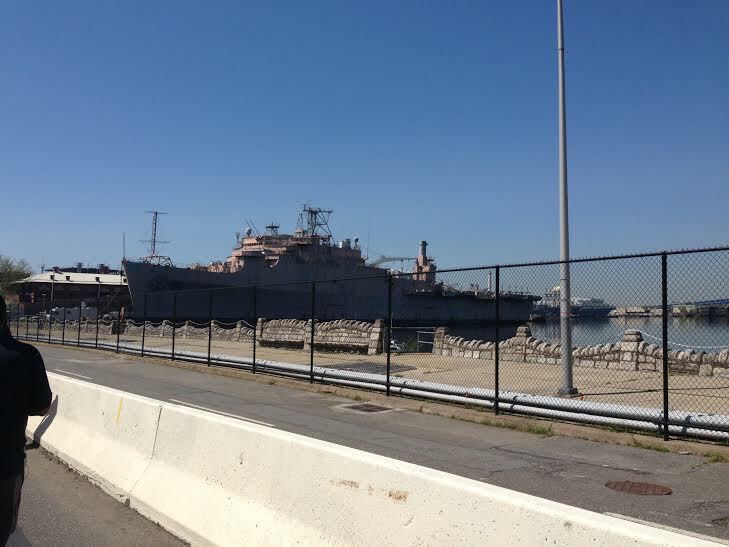 What’s a Navy Yard without a ship? As we drew closer and closer to the finish, I kept looking to Jay to see if he was ready for the sprint to the finish line. Once we were close enough, he took off like a shot and I knew that he was looking forward to wrapping up! His goal was to finish under 2:15. His reach goal was 2:00. Had we kept the same pace we did the first half, we would have hit 2:00. 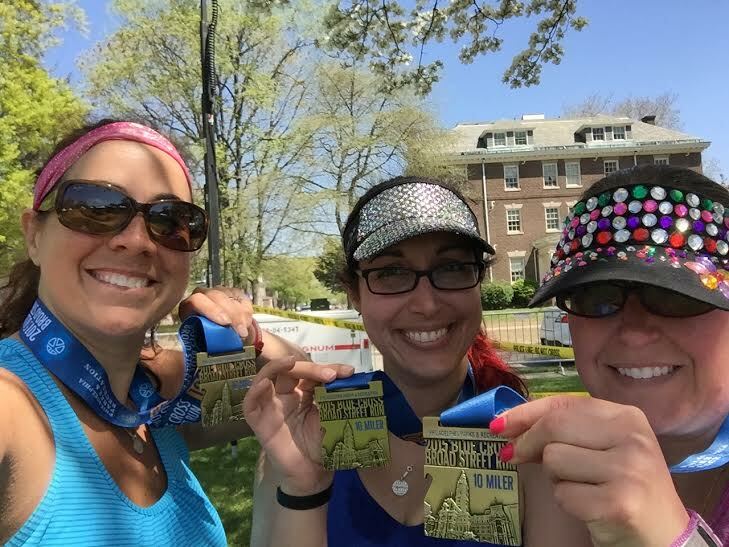 We finished in 2:11 which is exactly 13 minute miles – training run pace held true. We high fived each other at the end and cheered our accomplishment. Some louder than others, natch. We walked down the chute wondering exactly where we were headed. There wasn’t much guidance at that point. We continued to walk, in search of water, food, medals, something. Finally there were tables with water bottles. Then tents with bags of food and pretzels. 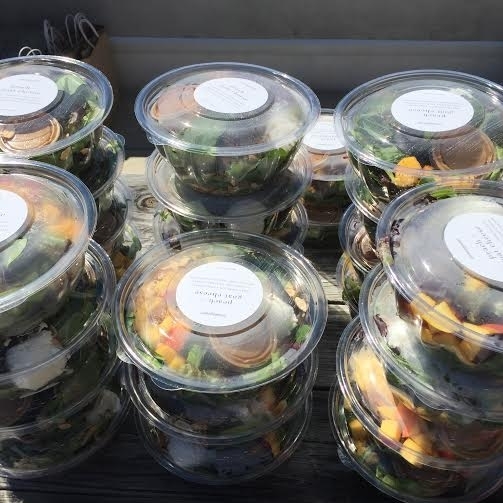 The volunteers were handing out the bags of food and the medals were nearly an afterthought. It was a bit odd. I understand not wanting to crowd the finishing chute with medals but I was surprised that they didn’t have more of a comprehensive flow in that regard. Eventually we got everything sorted out! 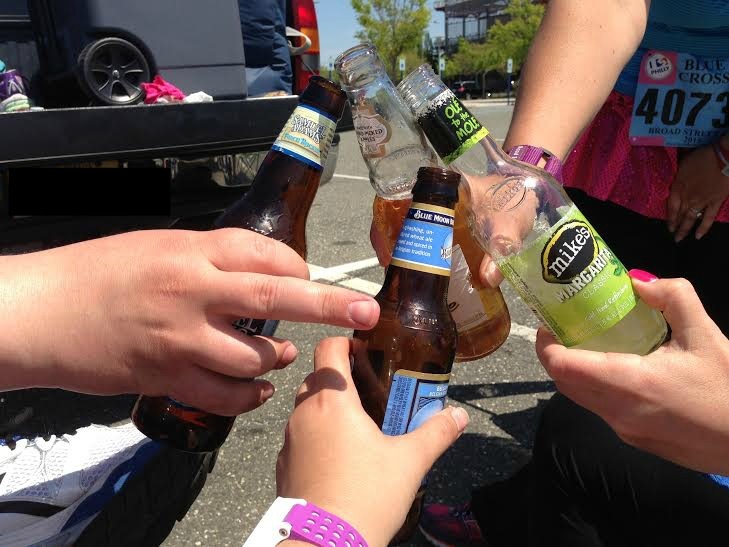 Our car held a glorious cooler filled with delightful beverages so once we finally got there we planted ourselves in the parking lot and relaxed, waiting for the crowds to disperse. He longs to be close to me. That’s why that finger is reaching out there. So, it’s over. But if I get in via the lottery, I’ll be back, Broad Street! You can count on it. 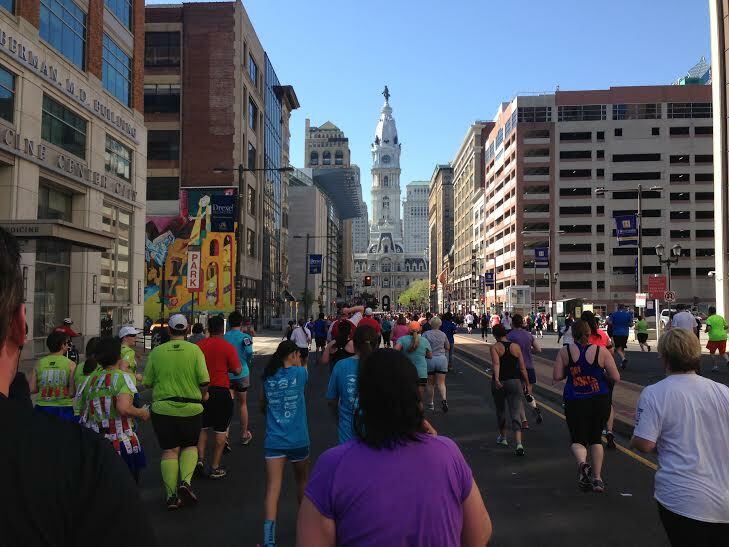 Have you ever done the Broad Street Run? Or a ten mile race? How about coerced your significant other into doing something they wouldn’t normally do?